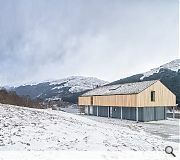 The project at Monachyle Beag was to create a new sporting estate within a 1000-acre upland holding in the Trossachs. 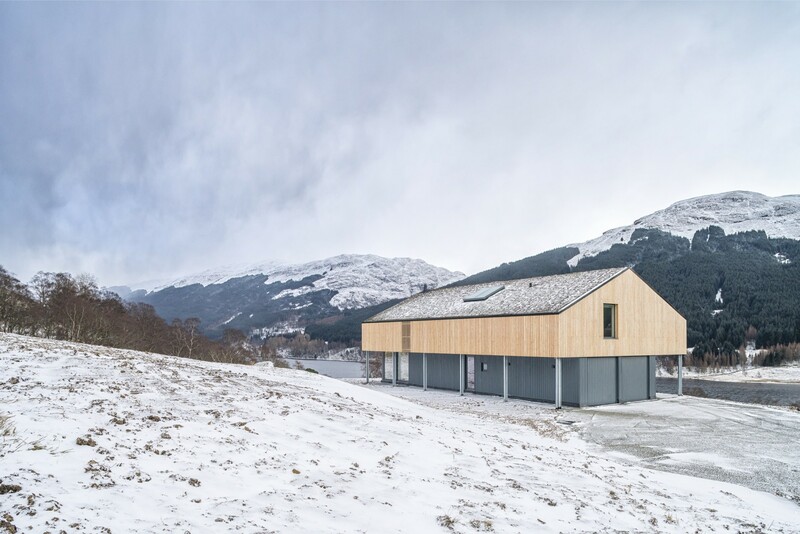 The centrepiece is a new hunting lodge which is perched on the edge of a mountainside looking over Loch Doine and to the upper reaches of Balquhidder Glen. The brief required a building to house stalking equipment and vehicles at one end and a luxury living area at the other end to allow guests to spend up to a week at a time stalking on the estate. 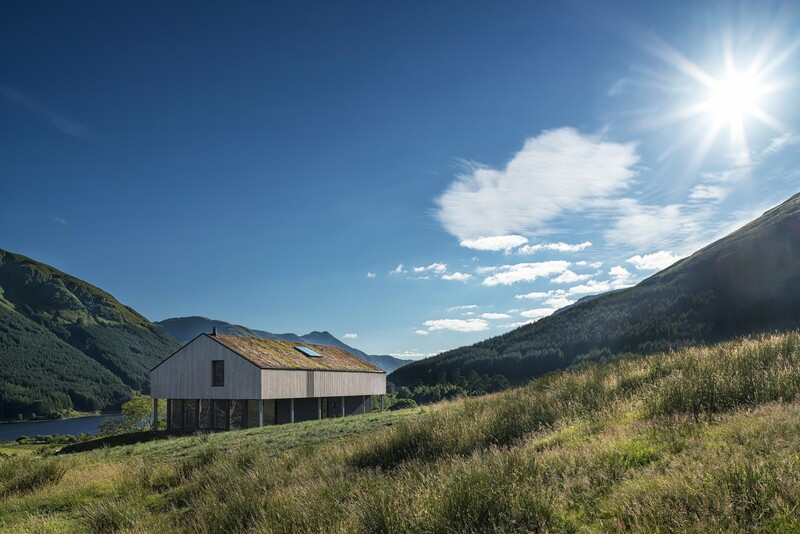 The lodge sits isolated on the hillside, a small forestry road was specially constructed to the site and the planning permission included a five-year planting plan to link areas of native woodland across the estate. The lodge is separated into three main elements – an oversailing barn-like structure under a sedum roof that minimises the visual impact of the glazing while also creating covered and sheltered spaces to view the landscape and to provide shelter for guests when coming off the mountain. The inner structure is separated into two elements; a solid utility section, housing vehicles, entrances and plant rooms and then a glazed box at the far side of the building that forms the main living area, enjoying 270-degree views of the surrounding landscape. 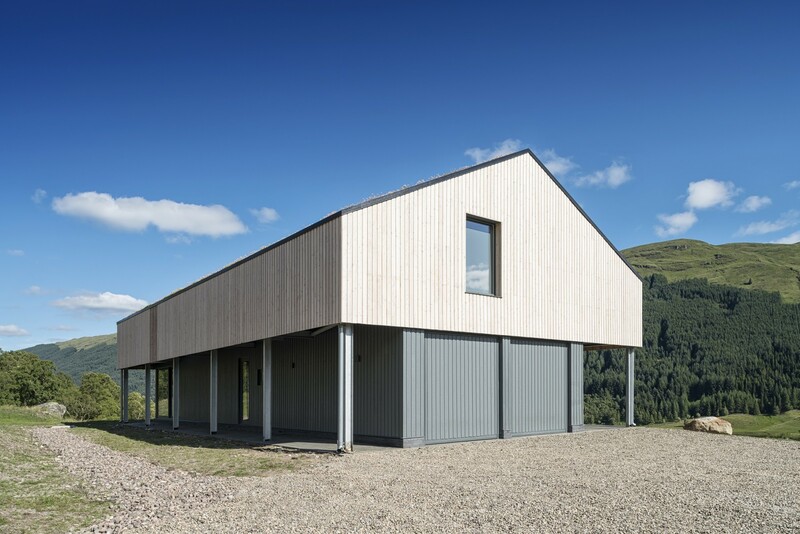 This inner structure is uniformly coloured in a flat grey to accentuate the shadows and the outer skin is a more highly textured, sun bleached Scottish larch. 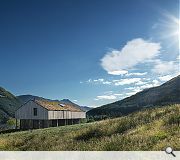 The utilitarian, rural architectural language is unfiltered; the lodge appears as an agricultural shed to the untrained eye and this was the most significant factor in the project gaining planning permission in such a remote location within the National Park. It remains anonymous and unnoticed by most visitors to the glen.